After more than one thousand miles by jet, 40 minutes by float plane, one hour driving, a hike, and a row we arrive to our destination: a 12 x 14 foot cabin in remote Alaska on Prince of Wales Island. We had the lake nearly to ourselves. A few loons, beautiful cutthroat trout, and some spawning salmon did join us. But what is that I hear? A chain saw? The sound gave me pause. It was not desired nor expected but understood. I, like all Americans, use a lot of wood and paper products. 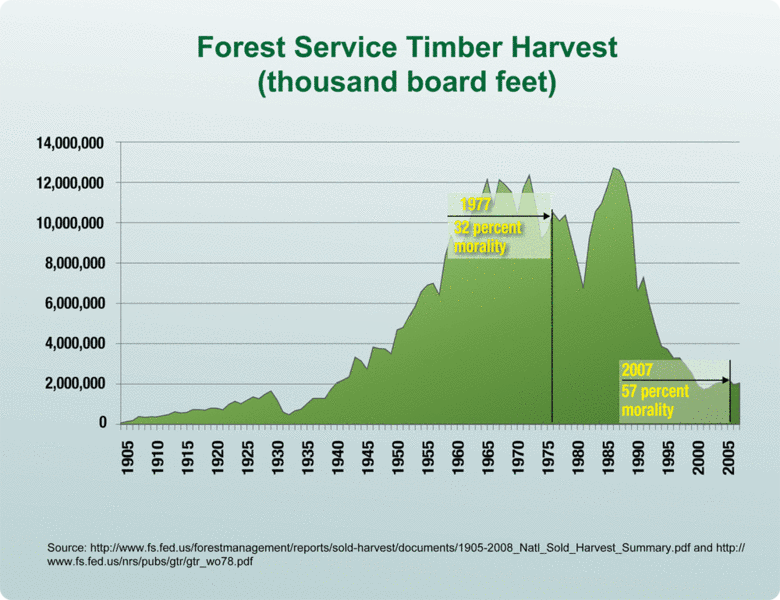 During the peak of timber harvest for the Forest Service, more than half the annual timber growth was harvested and used for timber products, the mortality rate was about 32 percent. In 2007, only 12 percent of national forest growing stock was removed from the forest and mortality increased to 57 percent. More and more national forest timber is left in the forest where insects and disease are taking hold. The result is lower valued timber and increased wildfire. Originally appeared at Environmental Trends.